Hell, I might even take up smocking. How did I not see this coming? My recipe sketch book is riddled with foods that would taste better with bacon fat. My family now calls on me for matters of etiquette and the other day my friend asked me to go to church with them and I didn’t run away. I guess 10 years in the South will do that to a girl and this post officially marks my giving in. Because if you can’t beat em’, join em’! 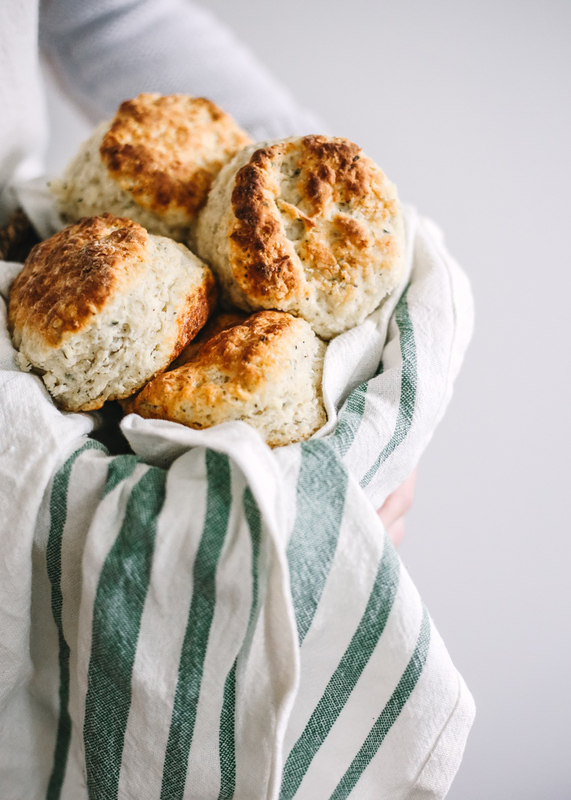 And what better way to celebrate the South than with a hot skillet of homemade biscuits? Now I must admit, it took me a few attempts to yield tall, flaky biscuits. My first few batches were more like dense, greasy hockey pucks. But it’s my job to learn the hard way and now I get to share with you my quick list of tips and tricks! Use fresh baking powder! Baking powder is a leavening agent that is responsible for helping the biscuits to rise. When it’s past its prime, it won’t do it’s job. If your baking powder is 3 months or older, toss it. I used 6-month-old baking powder in my first batch of biscuits (a.k.a the flat hockey pucks) and when I replaced it with fresh baking powder, I got sky high biscuits. Keep that butter cold! It’s imperative that the butter stay as cold as possible before going into the oven. I recommend cubing the butter (or grating it with a cheese grater) and placing it in the freezer for about 30 minutes before incorporating. Get that oven hot! An oven temp of 475 degrees will help your biscuits rise and make the tops nice and golden. I like to rotate the skillet 3/4 of the way through the cooking time to ensure even cooking. Don’t twist the biscuit cutter: It’s tempting to punch the biscuit cutter down and give it a nice twist, but doing so seals the edges and can prevent the biscuits from rising. Work quickly/a food processor is your friend: In an effort to keep the butter cold, it’s best to work quickly with biscuit dough and get it into the oven as fast as possible. Many seasoned biscuit makers swear by using their fingertips to pinch or snap the dough into the flour mixture. This method is fun, and makes you feel all Little House on the Prairie, but if you’re not quick, your butter will soften. For this I say, rely on your food processor! I’ll be sharing that method below for this recipe! These Parmesan and Herb Biscuits would be the perfect compliment to a Thanksgiving meal or atop a chicken pot pie. They are fluffy, savory and incredibly flavorful from the blend of black pepper and herbs. Cube the butter and place into the freezer to stay cool while you prepare the remaining ingredients, 20-30 minutes. Preheat the oven to 475 degrees F. and lightly grease your cast iron skillet, then set aside. In the bowl of a food processor fitted with the blade attachment, add the flour, baking powder, baking soda, sea salt, black pepper, garlic powder, rosemary, thyme and Parmesan cheese. Pulse 5 or 6 times or until the ingredients are evenly incorporated. Next, remove the cubed butter from the freezer and place the cubes in the bowl of the food processor. Pulse until the butter and flour combine to create a consistency of cornmeal or until the butter is the size of small peas - about 10 -12 pulses. Pour the flour mixture into a bowl and make a well with a spoon. Pour the cold buttermilk into the well and gently stir to combine. Be careful not to over-stir (about 10-15 stirs should do). You may need to use your hands to finish incorporating the flour. Scoop the dough out onto a floured work surface and sprinkle the top with flour. Gently knead the dough by patting it out into a circle and folding it in half. Repeat this step 2-3 times until the dough is soft and not too sticky. Finally, gently pat the dough out until it’s 1” tall all around. Press a biscuit cutter down on the dough and lift straight up. Line the outer rim of the skillet with the biscuits - allowing them to slightly touch, but not overlap - and then fill in the middle. You may need to combine the scraps and re-work the dough until you’ve made enough biscuits or used all the dough. Once the skillet is filled with biscuits, place it in the oven to bake for 15 minutes. My oven tends to bake unevenly, so I like to rotate the skillet about 3/4 of the way through. Once baked and golden, remove from the oven and let cool for about 5 minutes. Then serve warm or brush with melted butter and enjoy!